Mariposa's Tales MARIPOSA'S TALES: Happy Hearts Day! Hope Bro-in law finds a donor soon. I'll be sending out good JuJu to him. Glad you are feeling a lil better!! Take a picture of your feed ! I will add you to the list of participants ! Oh your slippers look so toasty warm!!! Ohhhhhh those slippers look ultra comfy! Very nice! My slippers aren't furry, but SOFT is a key ingredient to successful slippers, I think!!! First, I love your new blog template Mariposa. How romantic. Hope you and IT Guy are soon on the mend so you can lose those nice furry slippers and put on your dancing shoes! 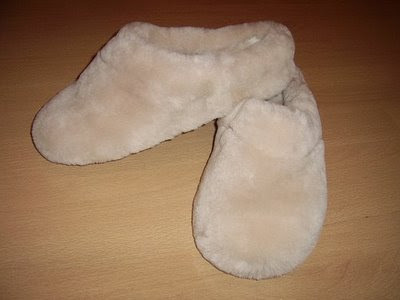 You needed those slippers especially this weekend to keep you snuggly while you get better. A prayer for IT's brother -- that he will get a donor and have a successful transplant. My prayers are with you for your Brother inlaw. Love your warm and fuzzy slippers. my post is up also, come on over, my name didn't make it on the list. Those look comfy and warm...just like i like them. I hope those warm cozy slippers help you feel better soon! I'm praying for It Guy's brother and hoping they find a donor soon. Hope YOU'll be able to stay well. Those slippers look comfy and warm. I played at Small Reflections today. I hope your relative gets better soon...I love your slippers and your new header photo!!! Hi sorry to hear about your bf's brother. Hope he manages to find a kidney. They look so comfy makes me think of a teddybear, lol ! They look all soft and comfortable, but I think I would die wearing those!! Those slipper looks really warm just right for a cold day. I'm so sorry you've been battling a cold. I do hope that IT Guy's brother finds a donor very soon. Just checking in to let you know I'm still praying for It Guy's brother and hope you're feeling better too. Hope you're feeling better by now. Love the slippers, I want to go out and buy a pair for myself actually. I'm back; just wanted to let you know. Hope the "It-Guy's" brother finds a donor soon. And I hope you're doing well too.